I'm so happy to share this recent finish! This quilt was a gift for a new baby in the family, and it's also my first quilt that is made entirely from paper piecing. 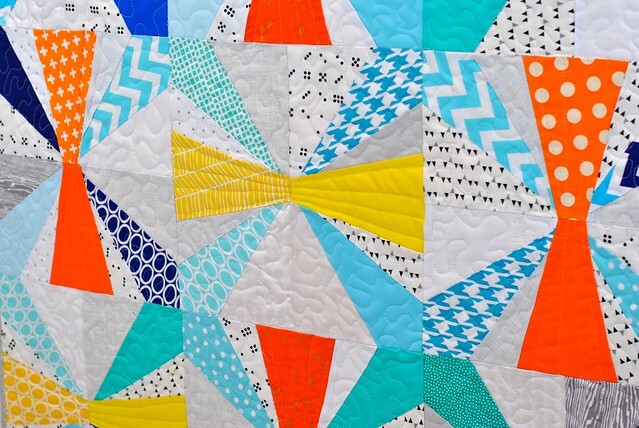 I've made a mini quilt or single block using this method of piecing, but never considered making a whole quilt until I picked up my friend's new book "Paper Pieced Modern: 13 Stunning Quilts - Step-by-Step Visual Guide" by Amy Garro (Stash Books). 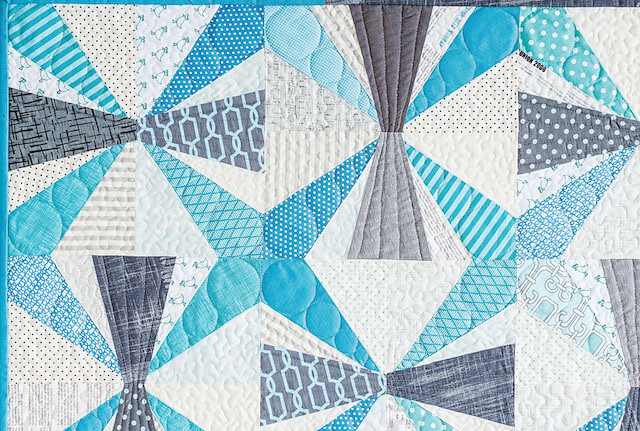 When you see this book and the stunning quilts in it, you'll realize that there's something awesome about the design possibilities you can get by sewing on paper templates. I didn't find it all that hard, and I actually feel like my technique has improved by sewing the same paper pieced block several times! 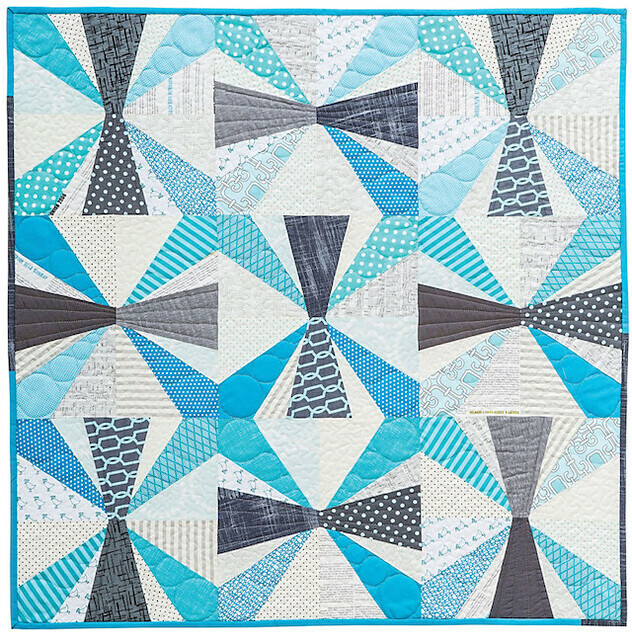 This quilt features a scrappy background of low-volume fabrics (crosshatch, dots, white, grey, woodgrain) and the colorful bits are mostly Kona solids and Ann Kelle Remix prints. The binding is Carolyn Friedlander, and though you can't see it, I used Ann Kelle flannel Flotologie for the back. I used my Tiara II and quilted a meandering free-motion pattern for all of the quilting except for the yellow and orange sections, which I filled in with radiating lines. Wanna See Amy's version from the book? Of course you do! I thought it would be fun to ask Amy about the inspiration behind this pattern, so read on for what she has to say. I thought this was a really fun photo of the quilt that Amy took before shipping it off to be photographed for the book. I love how Amy's piecing looks next to this reflective glass installation. 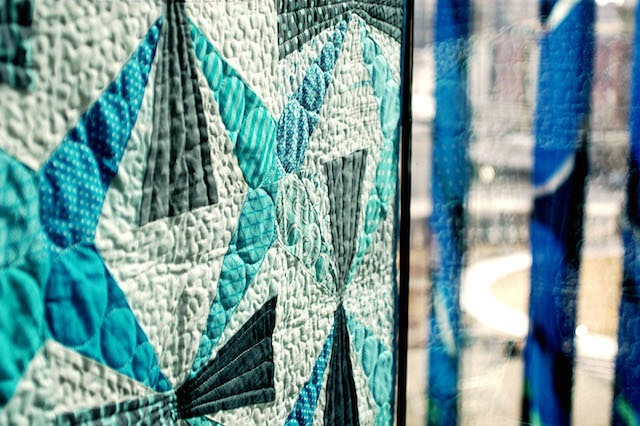 It reminds me of her cover quilt (seen below), which has a glacial, shards of glass feel. I love it! Baby Jacks is a 36" x 36"crib-sized quilt made from 9 paper-pieced blocks. Each block is formed in two different sections (so I copied 18 total pattern pieces). The patterns in the book are full-size, so no need to scale them. This pattern is perfect for using large scraps, fat eighths or fat quarters (you'll have leftovers)! "Paper Pieced Modern" is an outstanding value, with 13 patterns and full-size paper piecing templates. If you are nervous to give foundation piecing a try, don't be! The quilts look complex, but Amy's clear instructions make it easy and fun to learn. I highly recommend this book. Beautiful Lindsay! The more I paper piece the more I love it! This one looks like so much fun to make! HI, these are so striking>just so pretty! This pattern is great! I love both versions. I LOVE IT! Such a beautiful quilt for a lucky little guy! I keep thinking I should try paper piecing again. My first experience (14) years ago was not that great....maybe one day!! I love both versions of the quilt but am really drawn to the more colorful quilt made by you. Paper piecing is so much easier because the seam allowances are taken care of. Fabulous! I love the blue version! Been quilting a long time and have loved paper piecing right from the start! Now I am drawn to modern designs, so I would love to win this book. Thanks for the opportunity and if I don't win I will definitely be buying it! 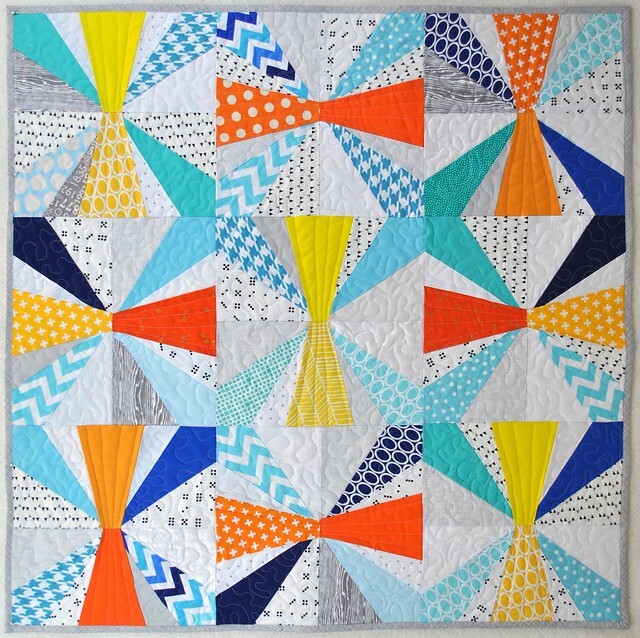 Love paper piecing and these quilts are gorgeous!!! Now I want this book!!! I love the fresh feeling of your quilt. The citrus colours really pop. Fabulous. I like both your version and Amy's version. I've done very, very little paper piecing so far but I have a feeling that this book will want me to try some more. Oooh, those are both really great interpretations of the quilt design. Beautiful work! I'm definitely thinking this book is going on the buy list! I love the idea of the bows so that you don't have to match all the points, brilliant! I love paper piecing ~ it's great that the patterns are to scale! Thanks for the review of this book ~ can't wait for it to be available! HI, SUCH A NEAT QUILT! Looks like a fun book to buy. New ideas. Your quilt is beautiful. I always love Amy's creations. Thank you for letting me know about her new book. I'm very excited about the new book and excited for her. Hi Lindsay, love your stuff. Saw the cat on the quilt photo at Craftsy (your article, someone else's photo, and would like permission to use it as a reference for a painting. I love the colors and design . . . beautiful quilt! Fabulous version! It's so interesting to read where Amy's inspiration came from. I love the spin on the pinwheel shape. This looks like a great book to me, lots to pick from that I'd actually make! I just discovered this hop so I'm going back to visit sites I'd missed. Love this sweet quilt. I do enjoy paper-piecing so I think this book would be right up my alley and the new modern look is fabulous. I love your block, especially because it's all paper-pieced! Amy's book looks exciting! I love this quilt, esp. in blues!